Ben Britton is a wonderful saxophonist who I met online a year or so ago. I listened to some of his sound samples and reached out to him because I loved what I heard. He’s a jazz musician, an educator, a blogger, and now an author. With this book, Ben is bringing many years of personal experience as well as a lifetime of lessons from such wonderful players and teachers as George Garzone, Chris Potter, Walt Weiskopf and others. If you are willing to put the work in you could end up with the sound you’ve always heard in your head (or on recordings). When I was in college I think my sax teacher was more of a Larry Teal guy as opposed to a Joe Allard or Sigurd Rascher guy (the approach that Ben presents). So I was taught to take a lot less mouthpiece than what I do now and my embouchure shape was different although it should be noted my teacher did recognize that I didn’t fully fit into his approach. He liked my sound anyway so he let me go on many things. In the intervening years as I have played more and more in many varied situations I have learned a lot from talking to numerous people and my approach is much closer to what is in this book but there are definitely things I was unaware of and things I have lapsed on that could be better. The book starts off simply enough with a discussion of air support and embouchure and their importance as a foundation for everything else that you will be adding as you go through the book. There are two chapters dedicated to these important concepts and the stage is set for future chapters as the exercises go from easy to challenging. You can do as much as you are comfortable with and then add more advanced exercises as you feel your progression warrants it. There’s some really interesting stuff in these chapters that I think I’ve always done but no one ever explained to me what was going on or why it was important. The exercises start with mouthpiece only and progress through the expected long tones but then they get pretty advanced with the introduction of bends and sub-tones. I was really excited by the description of how the vocal chords can restrict volume without losing support…I use my vocal chords a lot but I was never sure if it was right. Now I know that I wasn’t far off and I know how to make sure I am using them correctly in the future. The book really starts to take off (at least for me) in chapters 3 and 4 where you learn much more about embouchure and air support. One of the key things for me was his discussion of rolling the lip out for more flexibility and a full tone. It’s something I used to do all the time but I discovered that I had lapsed into a more tucked lip especially as my chops started to get tired on a gig. It’s going to be a process to change back but the included exercises once again will help build muscle memory and endurance. Another area I’ve always struggled with is tongue position. I have a tendency to have a lazy (usually positioned too low) tongue but truthfully I never knew exactly where it should be either (or had forgotten). The tongue bend exercises in chapter 4 actually do a great job of showing me where it should be by having me take it where it isn’t supposed to be in the bend. Chapter 4 is also notable for the grueling overtone exercises Ben includes at the end of the chapter. This is a section you will want to ease into because it’s easy to get tired out very quickly and Ben points out that you should concentrate on tone quality above all else so you should stop when tone is being sacrificed. Don’t worry, playing these exercises as part of a daily regimen will build endurance and facility so there will always be new territory to chart. The exercises are divided into two parts with the second part much more challenging than the first. Chapter 5 is dedicated to articulation and includes many exercises to make you pick apart what you are doing and get a feel for the correct way to do it. Chapter 6 is a very helpful discussion on incorporating all of the concepts into a daily warm up and practice regimen. Finally, there is a glossary for any terms you may not be familiar with. As if all of that wasn’t enough, Ben also has numerous audio clips on his website demonstrating many of he key concepts from the book. You can download the whole package as a zip file. It’s very helpful to hear a great player demonstrate the difference between rolling your lip in or out or what the overtone exercises are supposed to sound like. I think having these examples really sets this book apart from other similar offerings on the market. I think this is a book that anyone could benefit from whether you are just getting started or you’re a seasoned pro. For beginners it provides a great start and an excellent progression and it’s the kind of thing you can take to a lesson to discuss. For advanced players it’s a chance to look critically at your fundamentals and make sure you’re where you want to be. The book is not expensive but the information is incredibly valuable so do yourself a favor and buy it. I’m hoping to see more books from Ben in the future. Ben has some sample exercises, the zip file of audio examples, and a pdf of the table of contents here. You can buy it at Amazon (best price), CreateSpace, or a less expensive digital version at Payhip. It’s the Christmas season so put it on your list or treat yourself to something nice. I think you will be happy you did. 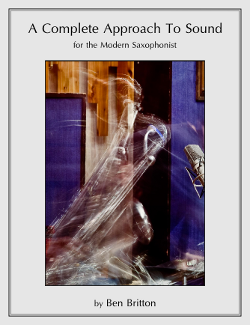 This entry was posted in Beginner's Corner, Books, Opinon, Reviews, Technique and tagged Ben Britton, breath support, Complete Approach to Sound, embouchure, modern sound, review, Saxophone by Barry. Bookmark the permalink.